The Triple Twister real money slot from RealTime Gaming is a comical romp through a middle American farm as the winds blow and tornadoes spin on the horizon. Replete with a cast of characters that look as if they could be found on Dorothy’s Kansas farm in The Wizard of Oz, this 5-reel, 50 fixed playline slot comes with both minor and major progressive jackpots, dramatically increasing your chances of being carried away in a swirling whirlwind of cash prizes. Rendered in a soft, comic book-like style reminiscent of happy go lucky children’s books, there’s a storm on the horizon and the wind is blowing something fierce as the pitch fork carrying, green overall wearing farmer and his lovely but worried wife with a pink carnation in her blue bonnet scurry around the farm trying to get the animals to shelter in the barn before the triple twister hits. 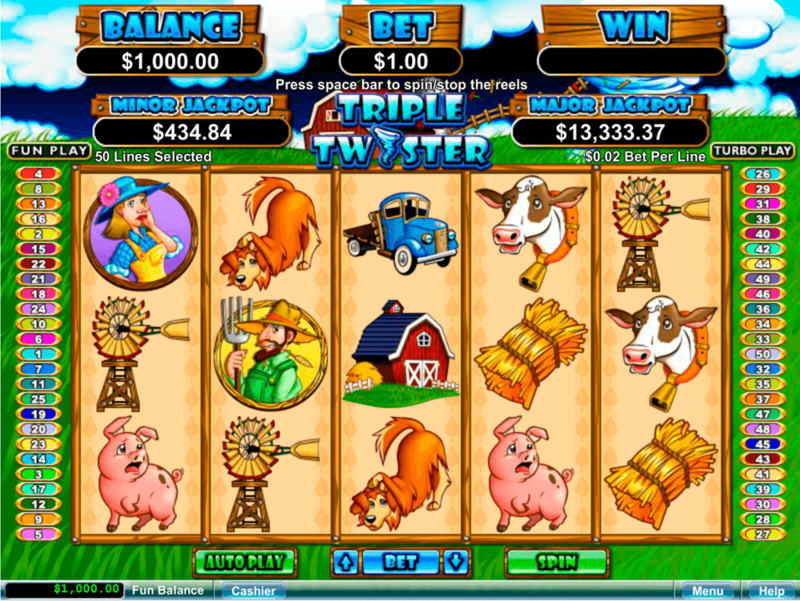 Characters in the Triple Twister real money online slot from RTG include a frightened but oh so cute dog, a terrified baby pig clearly alarmed by the impending disaster, a somewhat perplexed moo cow, and a host of typical farm accessories including a chugging green tractor, an old blue pick up truck, a windmill, bail of hay, milk bucket, and rooster topped weather vane and of course the safety and security of the quaint little red barn. Perks in this delightful and charming slot include a win-win feature that sets in as soon as any free spin feature is over, a swirling tornado on reel three that triples your prize, a top fixed jackpot of 3,333 coins and not one but two progressive jackpots, major and minor, to make all that hard work on the farm well worth it in terms of amazing payoffs. The twister symbol, which appears only on the third reel in regular play, stands as the wild and can be substituted for all other symbols including scatters. The rooster topped weather vane is the scatter, which triggers free spins that can award from nine to 33 free games. If the overall total win from the free spins feature tops 10x the bet that triggered it or less, the win-win feature kicks in, meaning that the lower your win the higher the actual prize multiplier. Of course, here at USA Online Casino we go to extreme lengths to bring you only the best and brightest real money casinos for slots play on the internet today. If you’re in the mood for some winning fun on the farm, check out the Triple Twister real money slot machine on our list of recommended and certified casinos. To start to play Triple Twister the first thing you need to do, after registering and making your real money deposit of course, is to set your bet amount. The bet button is located in the center bottom of the screen and bets can go as high as 500 coins. Triple Twister is a 50 fixed playline slot, with all symbols paying left to right including the weather vane scatter symbols. In normal play the tornado substitute/wild appears on reel three only and acts as a substitute for all symbols including the scatter weather vanes. The twister wild will expand to cover the entire reel before any payouts are awarded. When one of more whirling twister symbols appear in a winning payline, your prize is tripled. The twirling rooster topped weather vane works as the scatter symbol. As the rooster spins in the wind and lightening strikes, the scatter can award up to 33 free spins for five, which is increased to an amazing 99 free spins if a twister wild also appears. Surviving the harrowing storm can be quite lucrative in Triple Twister as it is one of a limited number of progressive jackpot slots that have both major and minor progressive jackpots as well as a fixed jackpot of 3,333 coins.